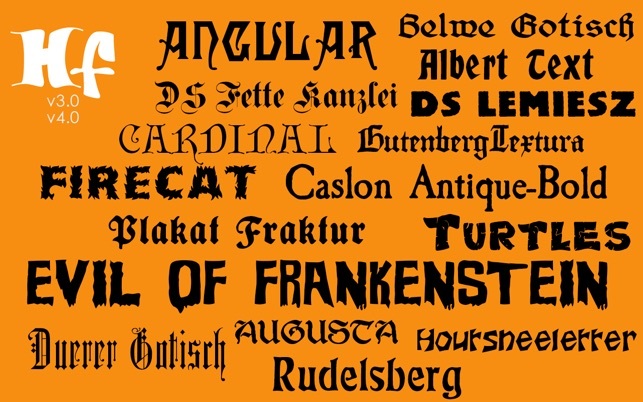 Need to scare up some new fonts? 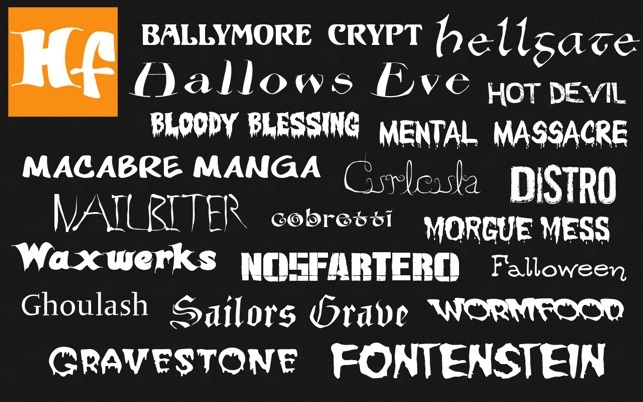 Dig up some wildly creative font styles that make any Halloween-inspired project a hit! This commercial use font collection now includes 45 original fonts in OpenType font format (we just added 5 new ones in version 4! ), and can be used for any personal AND business project. International character support is NOT standard for every font but is available for many of them. These fonts are different from other font collections you may have purchased or downloaded recently (Premium Fonts, Free Fonts, 1000 OpenType Fonts, Free Fonts - Christmas Collection) and are an excellent addition to any font collector's library for use in graphic design, web design, party signs and invitations, banners, promotional material, advertisements, application development and more. 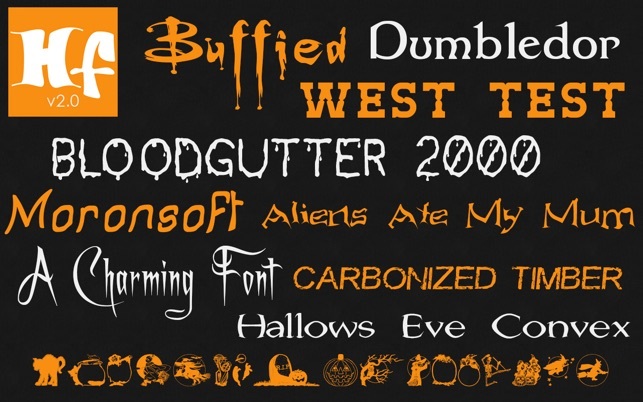 Download now and you will continue to receive new Halloween fonts each season! • BONUS: Includes a custom font preview app to see how the fonts look when applied to text, before you save and install them! PLEASE NOTE: The fonts are not automatically installed when you install the application. 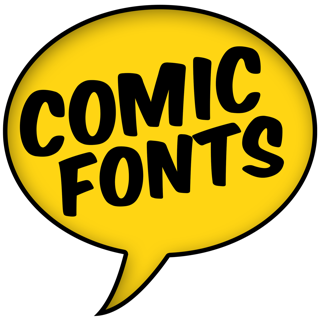 You need to open Halloween Fonts from your Applications folder and then click the Copy Files button in the main window to save the folder of fonts to a location on your computer. Since this is an application and not a font file, it cannot be installed using Font Book. And the only guidance it gives for installing says “follow the instructions for loading fonts.” The Mac OS instructions say to load new fonts from Font Book - which won’t recognize another application as a font file. So you end up saving an application of fonts to your computer thaa you cannot use directly from the app and cannot use in any other appication (those rely on Font Book for their fonts). Just follow the instructions in the main window. The fonts are not automatically installed when you install the application. 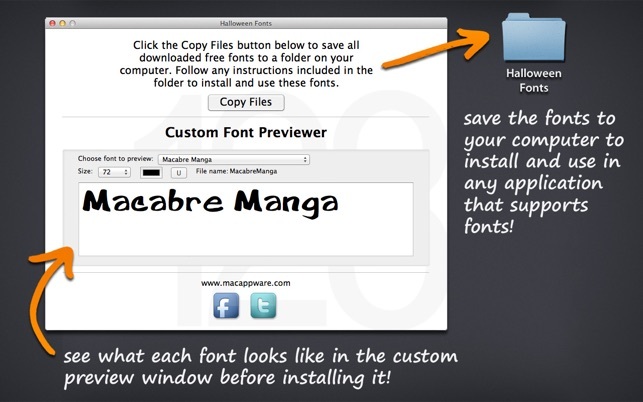 You need to open Halloween Fonts from your Applications folder and then click the Copy Files button in the main window to save the folder of fonts to a location on your computer. Then you can use Font Book to open the fonts in the folder and install or activate them. If you are doing anything (poster, flyer, ad) for announcing a Halloween event (party, parade, etc.) you can't miss with these fonts. Mix and match for a creative look. 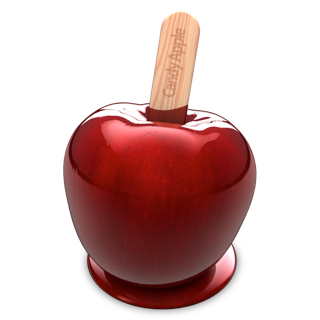 Try "Hot Devil" and color it red in whatever design software you use for a really neat look. You can't miss with these fonts. So many choices! I really like these fonts. They’re done nicely for the most part. But I found 2 that were cut off at the top if you use capital letters. I understand that these are free, but that would need to be fixed. All the others look fine and I really like them.